To ensure your visit is safe and comfortable we have the following terms of entry that we ask visitors to abide by when using Casey RACE and its facilities. Children under the age of 10 must be actively supervised by a parent/guardian 16 years or over in the centre at all times. You must not bring any alcohol, drugs, weapons, glass or other breakable objects onto the premises. General rough play or unsociable behaviour is not permitted due to safety concerns. Patrons are required to follow staff directions at all times; failure to do so may result in eviction from the centre. You must not bring any animals other than a Guide/Assistance Dog onto the premises. Causes damage to the premises or any property. You must not leave your personal property unattended other than in a secured locker. To the extent permitted by law, neither the YMCA nor the City of Casey accepts liability for any loss or damage to your personal property on the premises. Due to the depth of pools diving is not permitted. You must have all relevant individuals consent to take and use images. It is illegal to broadcast or publish images without consent. Under no circumstances are cameras, video cameras or mobile devices to be used in change room areas. The User/Hirer must indemnify and keep indemnified and hold harmless the City Of Casey and Casey ARC Management from and against all actions, claims, penalties, demands, costs, expenses or damage in any way related to any act or omission of the Casey ARC Management or of any person acting on the behalf of the Casey ARC Management in respect to the use of services and facilities of the Centre. Failure to comply with these Conditions of Entry may result in you being refused entry to, or evicted from the premises and any membership you have suspended or cancelled. 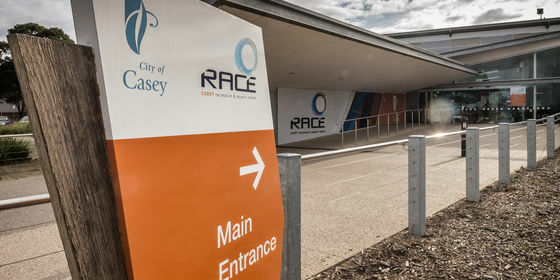 To the extent permitted by law the YMCA and the City of Casey reserve the right to refuse entry to any person or evict them for any reason including if a person appears to be under the influence of drugs or alcohol. CCTV in operation throughout facility. Please take note of area specific conditions of entry throughout the facility. Patrons must wear suitable attire for the activity being undertaken.